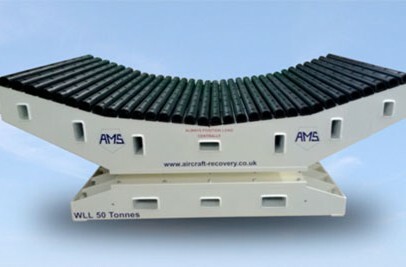 AMS celebrate 25 years in aircraft recovery this year and as part of this landmark we are delighted to launch our new 50 tonne turntable. Our close relationship with British Airways provided the catalyst for creating the first turntable specifically designed to deal with nose gear failures for larger, wide-bodied aircraft such as the A380. The curved profile and buffer interface allows aircraft to sit within the bed of the turntable. This reduces the point load applied to the fuselage and helps recovery teams centralise the load (while increasing stability and control when towing). Rotation is via a high load bearing, covering 50% of the contact area to ensure loads are fully supported. Rubber buffers provide additional security for absorbing high loads, compensating for uneven and damaged areas, and reducing point contact to minimise secondary damage. Multiple swivel eye locations are provided for attaching fuselage securing slings, while fitting points on the lower section support the attachment of swivel eyes to secure the turntable to transportation vehicles. The turntable can be positioned on any suitable multi-wheeled transporter capable of carrying the load. The disabled aircraft can then be moved as if the undercarriage was still in place. Turntable systems have been proven many times in recovery situations. Our new turntable is set to become an essential piece of equipment for the growing number of airlines adding the A380 to their air fleet. For more details please download our AMS 50 Tonne Turntable Information Sheet, call us on +44 (0)1420 23777, or contact us using the form on our website.